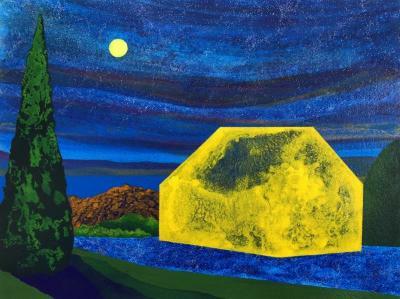 James Isherwood appropriates the generic, four-walled barn to use as the architectural protagonist in his current paintings, combining them with layered, textured environments. Using the simple geometry of the rural framework, Isherwood examines subtle changes in space, color relationships and developing structures. The paintings attempt to bridge the gap between the world we live in and the journeys forged by our imagination. Isherwood was born in 1971 in Fall River, Massachusetts and graduated with a BFA from Parson's School of Design in 1993. He lives and works in New York City.